From newcomers to the elderly, many community residents don't have a state-issued ID card or driver’s license. Photo IDs are often required proof of identity to access many services, including health centers, city or county departments, [caption id="attachment_7668" align="alignleft" width="269"] Example of a Community ID Card[/caption] services from schools, social service agencies, law enforcement, and to participate in cultural and business life in our communities. 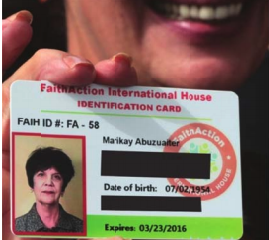 To meet this need, AMOS congregations in Story County are launching the Central Iowa Community ID card, a photo ID that is reliable proof of the holder’s identity and residence. All those 16 yrs. or older are eligible for this ID card. The first ID card drive is Saturday, March 30, at St. Cecilia Catholic Church, 2900 Hoover Ave., Ames. Doors will open at 9:00 AM. Allow an hour or more. The card costs $8 (cash only) and has a life of two years. All proofs of identity and residence that are used to get an Iowa driver’s license are acceptable, but in addition, some alternative forms of identity documentation can be accepted. Please phone (515) 599-8149 or go to https://sites.google.com/view/communityid/home for information about what forms of proof you will need and what to expect.